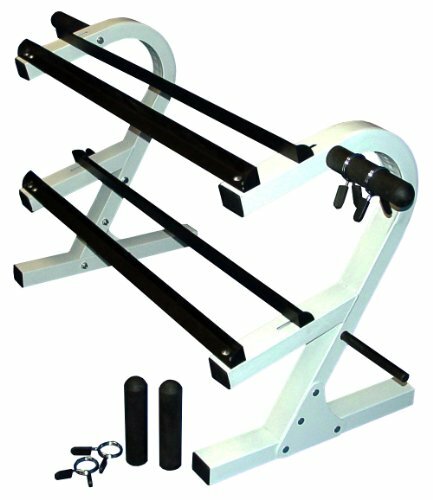 2 Tier 44'' Dumbbell Rack w/ 2 Olympic Adapters & 2 Pairs of 1'' & 2'' Spring Collars by Ader Sporting Goods at Strongman Pictures. MPN: DR-2-44AP. Hurry! Limited time offer. Offer valid only while supplies last. Weight is 65lb- 50% heavier than similar racks. This can also be used to hold chrome or pro-fixed dumbbells. Very good for home or small office use. Weight is 65lb- 50% heavier than similar racks. This can also be used to hold chrome or pro-fixed dumbbells. Very good for home or small office use. Dumbbells not included. Ship out 2-7 days.